With the Innori 22,400mAh portable charger, you'll never have to worry about your devices running out of battery. It packs a huge charging capacity and 3 USB ports in a travel friendly size. Right now, Jalopnik readers can grab one for 42% off. 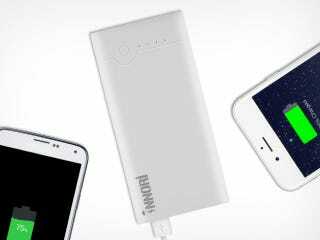 Innori's 22,400mAh capacity is enough to charge your phone multiple times over. Its 3 USB ports are equipped with "intelligent charging," which will recognize your device and allocate just the right amount of current to juice it up. The Innori's 4 indicator lights tell you how much power the device has left, and it doubles as a flashlight in totally powerless situations. You'll get all this in a slim, durable pack that you can take anywhere. Visit the link below to grab the Innori for 42% off. Shipping is free (available to the Continental US and the UK); all sales are final. For more details, check out the link below.